LOS ANGELES -- Some of the best things in life are free. Like the air you breathe, or the unbottled water that you drink. But some of life's pleasures are simply priceless. Like your first love, the first innocent kiss, and the subsequent walk on the aisle in marriage. Going to Staples Center here in Los Angeles for a Lakers playoffs game easily qualifies as a wonderful treat that bears limitless potential for a lifetime of memories and endless tales to be told. Unfortunately, this activity is not free. In fact, it's so exorbitant it could drill a hole in your checking account, or make your wallet suffer from an abrupt weight loss. We did a research on the logistics a fan would need if he or she decides to root for the Lakers at Staples Center Monday night for Game 1 of the Western Conference Semifinals. And here's what we found out. A courtside seat will set you back $2000, and those seats are sold out said Mauro, a Ticketmaster agent who answered our call Saturday afternoon from his company's call center in Texas. But he did offer the "best available" ticket worth $431 located on the risers behind the baskets. We also checked the website of Ticketmaster, the official NBA ticket seller. The browsing yielded the following information. Premiere level seats cost $286, section 205 in the Loge 200s were tagged at $186 while section 105 in the Loge 100s priced at $291 inclusive of "convenience charges." Tickets at section 300 were a mere $130.25. But up there at the nosebleed section, Kobe Bryant looks no bigger than your index finger. You might want to bring a pair of binoculars or borrow a giant telescope from NASA. If you drive to Staples Center, be prepared to plunk $20 for parking. The nearby Convention Center charges only $15 and if you want something cheaper, you can meander to the neighboring residential areas for $10 or less. But then you'd have to drag your weary legs a few blocks to reach the arena. Beer is $9 a cup, expensive enough to make you renounce alcohol. Medium Coke is $5, and that will make you appreciate tap water even more. But if you can't resist the bubble of carbonated water, you can fetch a small Coke for a delightful bargain of just $3.75. Hungry already? Get a veggie burger for $7.50. But from where I come from, anything over $2 must have meat in it, don't you think? But then again, you can choose to just nibble on a plate of Super Nachos. And for $6.50, you hope those chips better be super. Staples Center also has an array of hotdogs, pizzas, Zebra popcorn and kettle corn which is glazed over with chocolate and vanilla. The cost? Sinful. 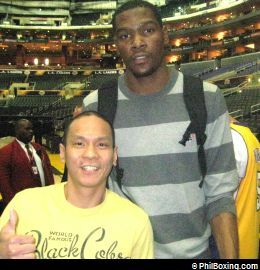 The author (L) with Kevin Durant. 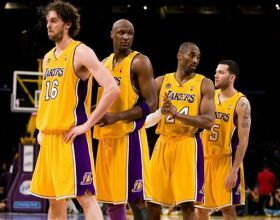 But then again, how do you put a price tag on the chance to see Kobe Bryant and his fellow Lakers play in person?. He is, after all, perhaps the best to ever play the game since that dude from Chicago named Michael Jordan. And can you really put a dollar value on seeing Phil Jackson as he weaves his coaching magic right before your very eyes? Millions of people have masters degree, but only so few can say that they saw the Zen Master in the flesh. Click here for more NBA Playoffs stories.